The RON fuel company has a long history with the motorsport world. Running their iconic blue and orange liveried cars in all seasons of the Multi-Class Endurance Championship has propelled them into view as one of the top racing sponsors and they've gone one step further with RON Raceway, using LSIA as a base for a fast and open circuit where driver skill is tested to the limit. Thanks to Evil, Scrazyy, MTK & Cynical. RON Raceway's National Circuit is arguably the most interesting of all the track variations. Containing the entire northern section of the main circuit this track starts in familiar territory before moving swiftly to what would normally be the final sector of the lap. Including the iconic Bus Stop chicane as one of its first sections in addition to the tricky final corner makes the National Circuit a popular choice for a lot of serious race meetings. 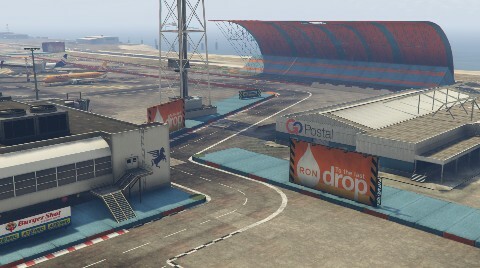 RON Raceway's Club Circuit is probably the most versatile of all the track variations. Composed of the middle section of the main circuit this track includes the main start finish straight, pit lane, tricky final corner, and the horseshoe section at the start of the lap. With it being much shorter than the full circuit you're never too far from safety and the Club Circuit is often considered the perfect choice for local club race meetings. RON Raceway's Indy Circuit has the distinction of being the shortest of all the track variations. Located in the southern-most section of the main circuit this track is somewhat disconnected to the central pit area and therefore has a separate start line & no pit lane, however it does contain one of the most iconic sections of the track with the Silverstone-esque chicane complex. The Indy Circuit is for quick thrills and action packed racing is almost guaranteed. RON Raceway's high speed Outer Ring is easily the longest of all the track variations. It runs a large loop around the outside of the main circuit and skips past all the more complex sections of corners, meaning you're likely to be at full throttle for around 95% of the lap. Also containing the iconic Bus Stop and Silverstone-esque chicanes, the Outer Ring requires you to be as brave as possible in whatever vehicle you're driving to get the best lap time.